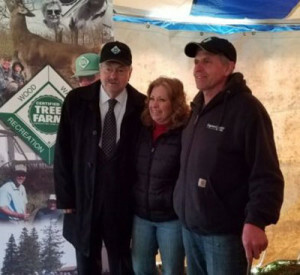 Governor Branstad with Jody and Jim Kerns at their tree farm. Iowa Agriculture Secretary Bill Northey says he appreciates the $9.6 million state legislators approved this past session for the state’s water quality initiative, but Northey is disappointed there wasn’t any long-term funding. Northey believes lawmakers understand the water quality initiative is working and having producers implement it on a voluntary basis is also a big plus. He notes, it’s unfortunate legislators couldn’t work out a more unified master plan for water quality improvements. Leeds says Hamilton County is seen as one of the state’s leaders in nutrient reduction strategies. “There’s a great group of farmers and organizations in the community that are working in the Boone River which is important to all of us who grew up in Hamilton County to really look at practices both in the field and in the water that are going to improve the current water and the downstream water,” he says. Branstad also toured a similar watershed area in southern Wright County this week. Last week, the governor visited water quality projects in northeast Iowa, including a tree farm near Edgewood. Jim Kerns and his wife bought the property in 1986. “It was a 15-acre crop field on the property, so in 1992 we planted the crop field to trees,” Kerns says. “Just thought that was a better fit for our family at the time.” Jody Kerns says the tree farm is the site of frequent education classes for the Ed-Co School District. “Many times we forget that trees are a very vital part of protecting the precious soils on our lands here in Iowa, which is some of our greatest resources that we have,” she says. The governor is holding events like this around the state to highlight soil and water conservation projects. It’s part of an effort to build public support for action in the legislature NEXT year on a massive water quality initiative. Jerry Oster, WNAX, Yankton; Pat Powers, KQWC, Webster City & Janelle Tucker, KMCH, Manchester all contributed to this story. Photo by Janelle Tucker.